It is almost time to head back to school! To celebrate this exciting time, School Sparks is offering a FREE Back To School activity pack to help make any young child's transition to school smooth and stress-free. Prepared by a retired kindergarten teacher, this activity pack includes engaging worksheets and activity suggestions to help children prepare to return to school. 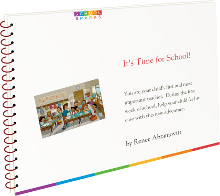 It also includes time-tested tips for ensuring any child has a great first week of school. In addition to this free activity pack, School Sparks also offers nearly 1,000 free worksheets on a variety of topics for young children, so feel free to grab some free worksheets while you're on their site to download the activity pack!